I'm pretty sure no one else will use this for their 'Y' in the a2z challenge from Patty Wysong. 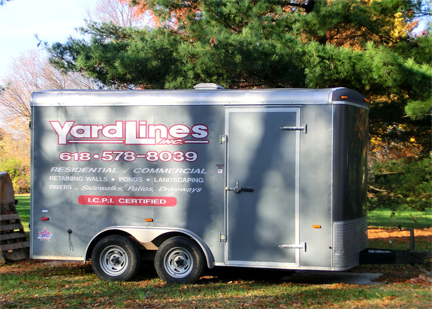 YardLines is our family business. There used to be a brick and mortar store--okay it was a concrete building. When Illinois regulations began to cost us to much money to continue hiring people and running trucks we downsized. A lot. Not everything needed to run a paver business is inside this trailer. We rent space to store other trailers, stuff and the bobcat. Unless it's going to snow then the bobcat goes in our garage so we can get to the main road. I keep saying WE own YardLines and on paper that's true. The real story is that Ed is YardLines. 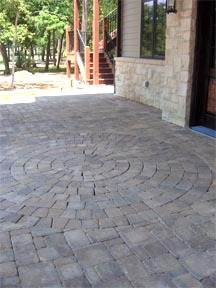 He has an amazing skill and talent for laying pavers. YardLines (ED) lays pavers at an amazing speed, he's put them in driveways, horse barns, patios, visitor centers, metrolink stations, roundabouts, and even an outdoor stage. Most of the time he works alone. YardLines (Ed) is a bit of a perfectionist. When I get to help I carry bricks, pick up trash from the paver pallets and find tools. Here's a few photos of what YardLines (Ed) has done. Because he does this I can write. I'm very blessed. YardLines, (Ed) also builds walls. If you want to see more of what YardLines does, visit Yardlines. What a talented husband you have. That barn is nicer than my house! Love the circle one. Amazing work! After all that hard work Ed must sleep very well. Whew. Very cool! I've been to Alton. Next time, I'll have to look for Ed's work! Beautiful! Love the yardlines! So glad that Ed's talent allows you to write! What a blessing! 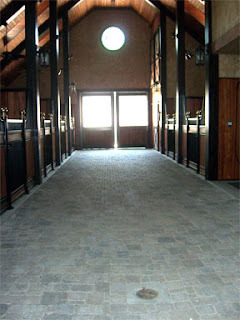 Your husband does beautiful work, and I love that you have found a way to keep your business afloat! God provides a way!